Italian Venison Wellington takes the deer tenderloin and wraps it in puff pastry much like Beef Wellington. In this version, we swap prosciutto for the usual pâté but keep to the traditional duxelles of mushroom, shallot, and herb mixture cooked in butter. This is the ultimate elegant holiday dish that you assemble ahead so you can enjoy celebrating with your friends and family. Until our son starting hunting I knew nothing about wild game meat. I knew there was the camp that absolutely loved the meat and then there was the other. I can honestly admit now that it’s a delicious source of protein and I’m in the “love it” camp. One of the main things, I learned, that you had to remove the silver skin. Never heard of that? I hadn’t either. The silver skin is a thin membrane attached to deer meat and it’s important to remove it. Membranes and connective tissues give the meat a “wild taste” so anything that is not rich red meat? Trim! We had to do this with our Italian Venison Stew. 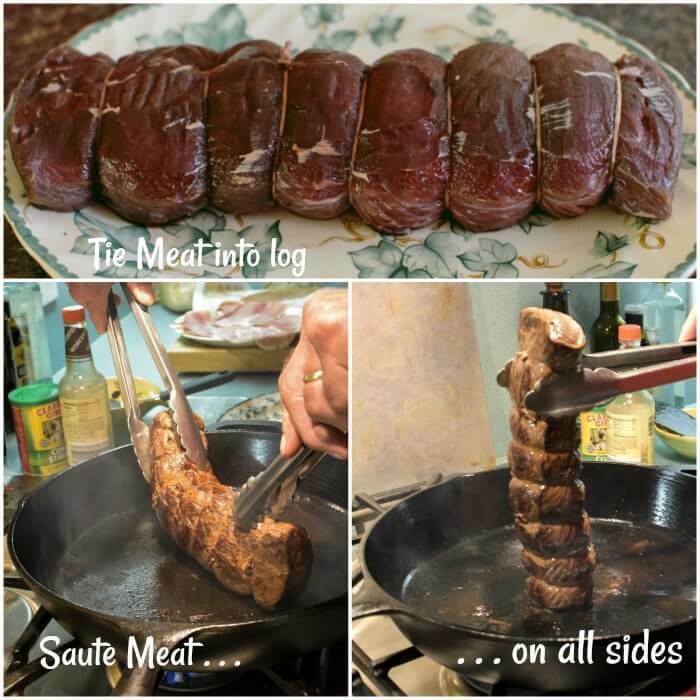 A tenderloin comes in an uneven cylindrical shape so in order to give it an even thickness, tie the roast. The butcher’s twine comes off before wrapping the meat for the Italian Venison Wellington. Next, drizzle the meat with olive oil, then season with salt and pepper. Sear the meat, including the ends, in a hot, heavy skillet that’s lightly coated with olive oil. This takes about 2 to 3 minutes. Transfer the meat to a plate and chill at least 30 minutes. Chop the mushrooms and shallots really fine. You can hurry this up with a food processor but we thought it might get too fine and end up with mush. Mince the garlic and fresh sage. Melt the butter in the same pan you used for the meat. Then, add the duxelles ingredients and saute for 8 to 10 minutes, until the mushrooms are browned and the moisture evaporates. Deglaze the pan with Marsala and cream, scraping up any brown bits. Stir in sage and season with salt and pepper. Let this cool to room temperature. Now, set out the prosciutto on a sheet of plastic wrap about 1 1/2 feet in length. I know that’s long but you’ll need it so you can wrap the tenderloin in the wrap. Shingle the prosciutto, like a roof, so it forms a rectangle that is big enough to wrap the entire venison tenderloin. Using a rubber spatula cover the prosciutto evenly with a thin layer of duxelles. Season the surface of the duxelles with salt and pepper. Cut the twine from the tenderloin, carefully, so it keeps its shape. Smear the meat with Dijon mustard — not too heavy of a hand. Roll up the meat in the duxelles covered prosciutto using the plastic wrap to tie it up — cozy and tight. Tuck in the ends of the prosciutto as you roll to completely cover the venison. Twist the ends to seal it completely so it holds its nice log shape. Set the log in the refrigerator for 30 minutes. This is the part along with the duxelles, that makes this delicious dish a Wellington. Mmm!! 😋💕 Meat cooked in puff pastry! All those wonderful juices contained in a delicious buttery puff pastry. I could almost write an ode to the dish. I’d better get back to the recipe, 😊 I think my tummy is growling! Okay, on a lightly floured surface, roll out the puff pastry to about 1/4-inch thickness. Depending on the size of your puff pastry you may have to use two sheets and overlap, pressing them together. Remove the venison from the fridge and cut off the plastic. Set the tenderloin in the center of the pastry and fold over the longer sides, brushing with egg wash to seal. Trim ends if necessary then brush with egg wash and fold to completely seal the deer tenderloin. 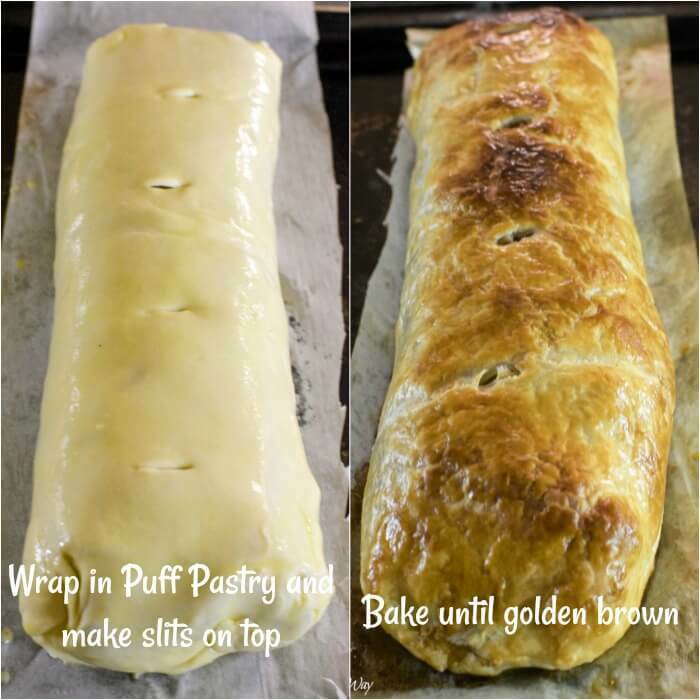 Place the puff pastry wrapped venison seam side down on a baking sheet. Brush the top of the pastry with the egg wash. Using the tip of a paring knife make a couple of slits in the top of the pastry. This creates vents that allow the steam to escape when the meat is cooking. 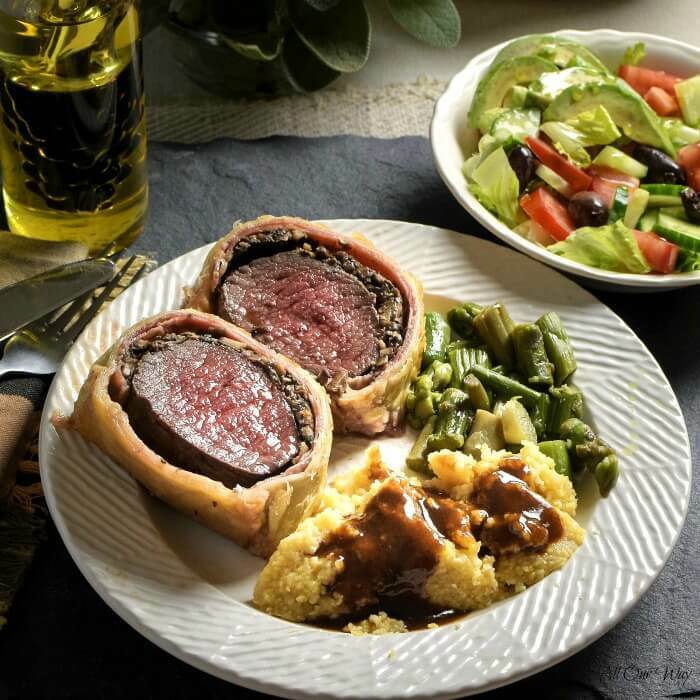 Bake the Italian Venison Wellington in a 425 F preheated degree oven for 40 to 45 minutes. The pastry is a gorgeous golden brown and the venison registers 140 F on an instant-read thermometer. Remove the tenderloin from the oven and let it rest for 10 minutes. Serve thick slices with Marsala Sauce. We wanted to keep the Italian flavors going so we decided to serve the venison tenderloin with a rich Marsala sauce. 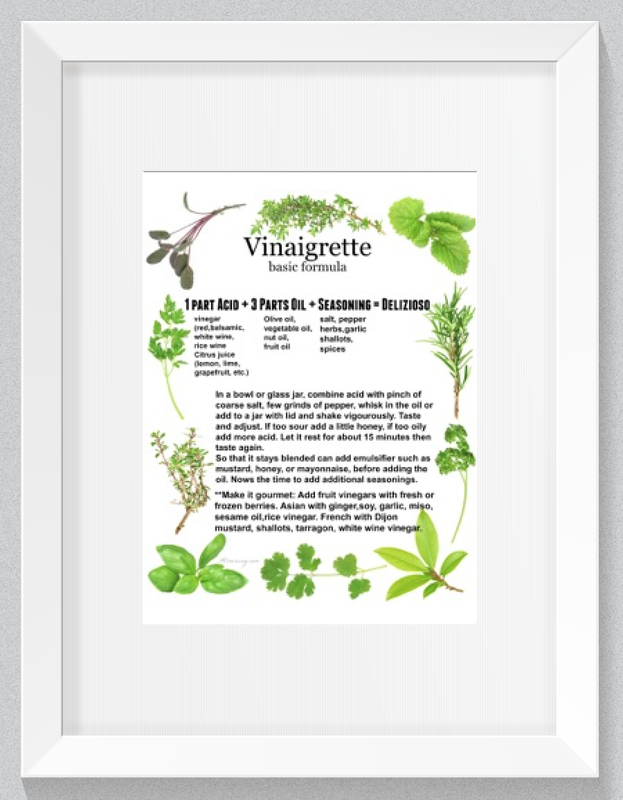 All it requires is just some herbs and aromatics to enhance the flavor. We use cornstarch to thicken the sauce and butter to make it silky smooth. If you aren’t fortunate enough to have a venison tenderloin in your freezer you can use this recipe to make a beef tenderloin. The procedure is exactly the same. Another delicious special occasion recipe you may consider is a standing rib roast with herb rub. The meat is outstanding. You may substitute beef or pork tenderloin for the antelope and if you purchase a prime rib just follow the standing rib roast recipe and it will be delicious! 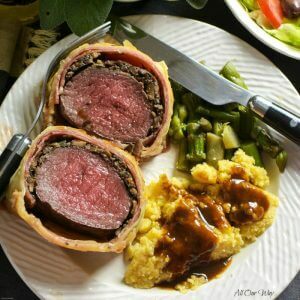 Italian Venison Wellington swaps prosciutto for the usual paté but keeps to the traditional duxelles of mushrooms, shallot, and herb mixture cooked in butter. The buttery puff pastry keeps the meat tender, juicy, and flavorful. A dish that is meant for any special occasion. salt and pepper -- quanto basta! Trim the venison tenderloin. Make sure there is no silver skin present. Bring the meat together so it's in a cylindrical shape and tie with butcher's twine in at least 4 different places. Drizzle with olive oil, then season with salt and pepper. In a hot, heavy skillet lightly coated with olive oil sear the meat all over, including the ends until browned. Do not overcook. Transfer to a plate and chill in fridge for at least 30 minutes. Melt the butter in the same pan over medium heat. Add mushrooms, shallots, and garlic. Cook until mushrooms are browned and moisture evaporates, about 10 minutes. Deglaze the pan with Marsala and cream, scraping up any brown bits, and cook until liquid evaporates. Off heat stir in sage and season with salt and pepper. Let cool to room temperature. Meanwhile tear a sheet of plastic wrap about 1 1/2 feet long. Shingle the prosciutto on the wrap so it forms a rectangle that's big enough to surround the entire tenderloin. Using a rubber spatula spread the duxelles evenly over the prosciutto. Season with salt and pepper. Remove the tenderloin from fridge and cut off twine. Keep the meat together in its log shape. Lightly smear Dijon mustard all over the venison. 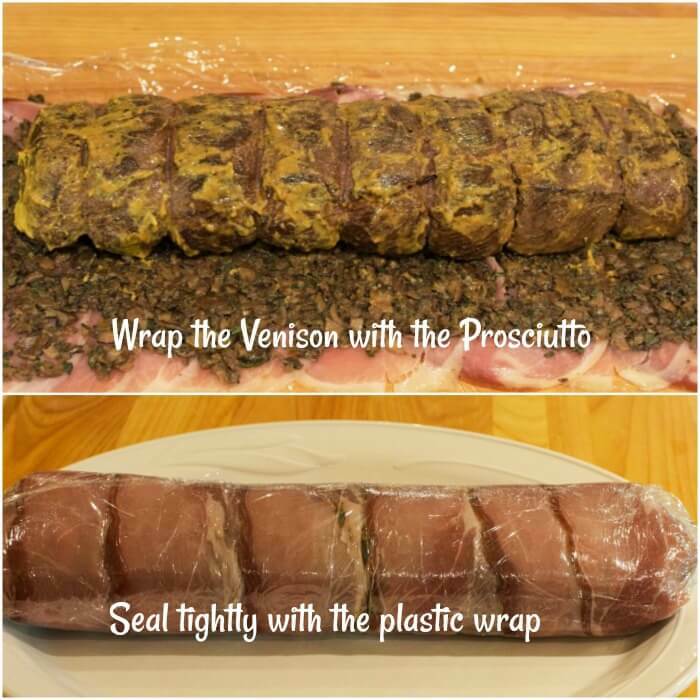 Place the venison lengthwise on one end of the duxelles covered prosciutto using the plastic wrap to roll it. Tuck in the ends of the porsciutto as you roll to completely encompass the venison. Roll it up tightly and twist the ends to seal it completely and to hold its log shape. On a lightly floured surface, roll out the puff pastry to about 1/4-inch thickness. Remove the venison from the fridge and cut off the plastic. Set the meat in the center of the pastry. Fold over the longer sides, brushing with egg wash and fold over to completely seal the venison. If you have extra dough you can use it as a decoration on top. We didn't have extra. Place the venison seam side down on a parchment lined baking sheet. Brush the top of the pastry with egg wash then make a couple of slits in the top of the pastry for venting allowing the steam to escape when cooking. Bake for 40 to 45 minutes until pastry is golden brown and the venison registers 140 F. degrees on an instant-read-thermometer. Remove from oven and let rest for 10-15 minutes. Serve thick slices with Marsala Sauce. Melt 1 Tablespoon butter in a saucepan over medium-high heat. Add shallots and cook until beginning to brown, 3-5 minutes. Stir in garlic, tomato paste, bay leaf, and sage; cook until fragrant, 1 minute. Deglaze pan with Marsala, scraping up any brown bits, and cook until reduces by half, about 5 minutes. Whisk together broth and cornstarch and shisk into sauce; simmer until thick 5 minutes. Strain sauce through a fine-mesh sieve;discard solids. Return sauce to pan and heat over medium-low; cook until reduced to 1 cup, about 5 minutes. Whisk in remaining 2 Tablespoons butter, one tablespoon at a time, until emulsified. Stir in Worcestershire and season sauce with salt and pepper. This recipe is inspired by Cuisine at Home Italian Beef Wellington and Tyler Florence's Ultimate Beef Wellington. Hands on time for this recipe may vary. The baking time for the venison is under an hour. The rest of the time is spent in preparing the meat and letting it rest. Note: Recipes and content from © 2014-2017 All Our Way are copyright protected. Please do not use content or recipe without prior written permission. If you want to share the information please link to this post. Grazie. Italian venison wellington is a wonderful sounding dish even though I’ve never had deer before. I’m quite shocked that it’s so easy to make. I used to think it was a complicated recipe but you make it looks super simple. What a great recipe! My oh my what a meal!!! I’d love to eat over at your house, Marisa! Everything you make looks absolutely divine and this wellington is no exception! Love all the flavors of this dish. If you can believe it we have Wellingtons at least 2 times a month!! Our local butcher always has a nice variety (Turkey, Salmon, Chicken, Beef) but I have never tried to make them myself!!! It would be half the cost and I would have enough to feed a lot more! Bookmarking for later! Marisa your blog reflects good home cooking. I love visiting your blog because it reminds me of my moms home cooking. One that’s cooked with love – hard work and good ingredients. This looks so delicious. 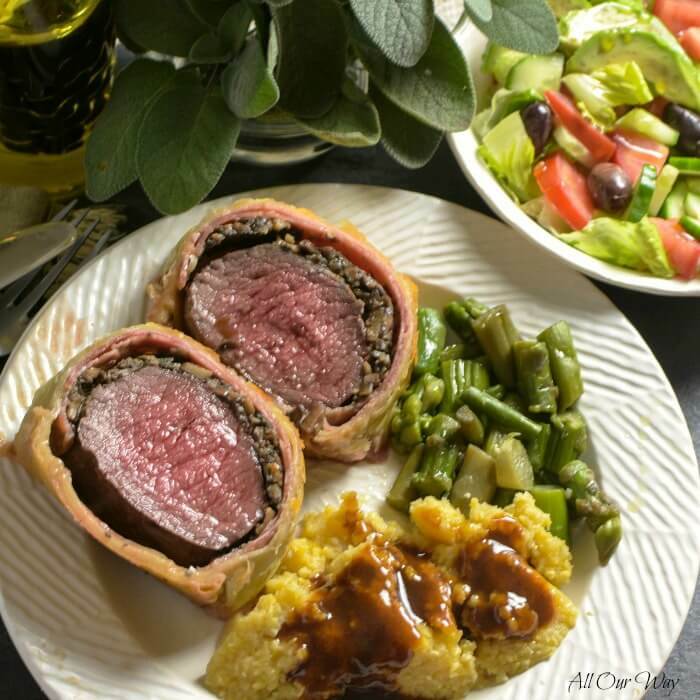 We love beef wellington but not tried Italian style. Next time I’m making this. My fiance loves venison and is hoping to go hunting himself this year. I’ll pass this along to him – he’s always looking for new ways to prepare it and will hopefully have a lot soon! What an elegant holiday meal … yet you make it seem so simple! seems like this would be a show stopper on the dinner table! Wow, that is definitely a gorgeous dish to serve during the holidays. Looks so fancy and so delicious – a crowd pleaser for sure. Your recipe is perfect for a festive table. And it’s perfect for any holiday. Love this. I’m sure this is incredibly delicious! Wow, you are a genius! Your recipe is really incredible! I would like to try it for dinner. Very interesting combination of ingredients. I really like. THANK YOU! Wow Marisa, this just gave me such a hunger. Looks absolutely delicious. I love how juicy meat looks. And that marsala sauce. Just one big yum.I love the addition of prosciutto and mushrooms too. I need to make this asap. My family and I enjoy venison! This is a recipe I’ve never tried, I’m looking forward to enjoying this next time we have some deer meat in the house. My sister always has venison … and is always looking for new recipes. I’ll share this one with her! So fancy and pretty, guest will feel special. I like your step-by-step instructions with photos, I’m a visual learner. Such a great looking venison dish. Great job with the recipe and it looks delicious! This sounds so absolutely delicious. Marisa, you have some really amazing venison recipes. This one looks so delish I want to pick it off the screen. I don’t get venison here so I’ll just have to wait until I do to try this one. Sounds so yum. My husbands hunts and we are out of venison I am saving this in hope he bags one this year and will surprise him this is unique and a perfect addition to the venison recipe family. WOW impressive! I have made beef wellington only once. I’m sure the venison would be amazing in this recipe. This is such a great company dish. Bring on the wine and enjoy!! Hi, Gloria!! Wellington is certainly the way to go. Makes the meat taste so much better. This looks so fancy! I will keep an eye out for venison when next I go grocery shopping. I know I may have seen it before, but I will check for real this time cos of this recipe. Ooh fancy! Is it weird that I have never tried a wellington before? I know a few people who for them this is their favorite thing ever, I NEED to try it out!! What a good looking dish! I may just have to try this for our Christmas Eve dinner. 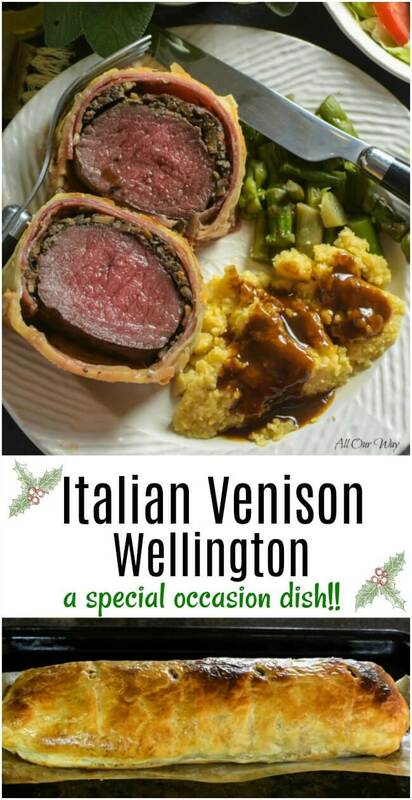 Marisa, I love your Italian Wellington – what an elegant centerpiece of any celebration! Brava! This is so fancy and such the perfect meal for the holidays!! WOW…my family would faint if I made something so fancy!!! I must impress them this Christmas! 🙂 I’m stumped on what to get my Honey…Gift giving is soooo hard. The kids, however, easy-peasy lol. Have a wonderful Christmas! I remember years ago when I made a Beef Wellington for my Christmas dinner……It was a show stopper and I have no doubt your Beef Wellington will do the same……PERFECT medium rare Beef Wellington….It doesn’t get any better😀You inspire me and I plan to try this recipe with new ingredients like the prosciutto, spices etc…..Thanks, for inspiring me. PS. I love your videos and look forward to joining you some day with comments while watching you cook. This sounds like a really great centerpiece dish to make over the festive period. Hi, Emily! It did look great and it tasted even better!! Hope you’re enjoying this wonderful season. This is definitely the best time of the year for classy and tasty food. 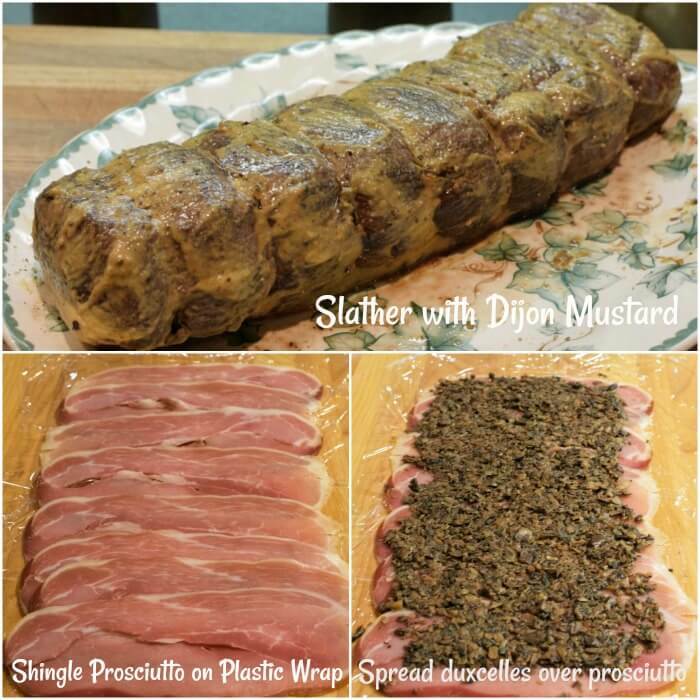 mushroom duxelles over prosciutto, with venison rolled in and covered with dijon mustard…. I am so hungry right now Marisa! Hi, Helene! I wish we could have shared this with you — it was so very good!! Have a nice weekend. I really like venison, this is a really good recipe for it. It looks delicious and has that ‘Wow’ factor, thanks for sharing this! Wow! For some reason I thought a Wellington was a more complicated dish, but your instructions show that it’s a time thing rather than a skill thing. Great job with the photos, too. It looks delicious. I’m going to pass the recipe on to my brother, the hunter. Hi, Lydia! Although there are a few steps — it really is an easy recipe to put together. It’s one we’ll be making for special occasions. Wow you have outdone yourself. One of my late brothers was a hunter who supplied me with venison and I loved it, especially the tenderloin. I love how you wrapped the prosciutto around it, putting the mushrooms farther away from the pastry, and giving a little protection from the moisture of the meat too. I bet you don’t have the typical soggy pastry that you so often find in beef wellington. Just a spectacular dish! Thank you, Linda! Venison is new to us and we get excited when we find a good recipe. Our son just started hunting two years ago. We are reaping the rewards of his interest!! I’m sorry about your brother. Un abbraccio forte. This is the perfect dish for a smaller Christmas Party or New Year’s Eve. “your Italian ingredients.” Forgot to proofread. I’ve done that quite a bit!! I like you Italian ingredients and flavoring for Wellington. I will definitely try them next time I make such a dish. Hi, Jovina! Next, we’re going to try it with pork!! I can’t believe how good it was.